…y’all know how much I love the yellow table at Cast-on Cottage. Hands down it’s the best place to knit with friends. It’s also where we have class – and a whole lot of fun – on Wednesday afternoons. Yesterday morning, one of my students texted that she had roofers at her house and would miss class. I texted back that we’d miss her, and she’d miss all the stories. She replied that I should take good notes. My quick answer back “what happens at the yellow table stays at the the yellow table.” ha! This is the table just after class. Plenty of project bags, WIPs and potential projects is typical, along with the Starbucks cups. But that empty bottle of Prosecco, half-empty bag of parmesan crisps, still-nearly-full tray of White Chocolate Popcorn and half-eaten carrot cake … not so much! We had a very fun time; and thankfully no knitting crises that kept me from fully enjoying all of it. 2. In microwave bowl, mix oil and chocolate chips. On 50% power melt chocolate chips stirring every 30 seconds until smooth. 3. Pour chocolate over popcorn mix and stir to coat. 4. Add in M & Ms and craisins, stir again to fully coat. 5. Pour out on wax paper for chocolate to cool and set. Within about 30 minutes it should be set enough to break up into smaller pieces. Done! 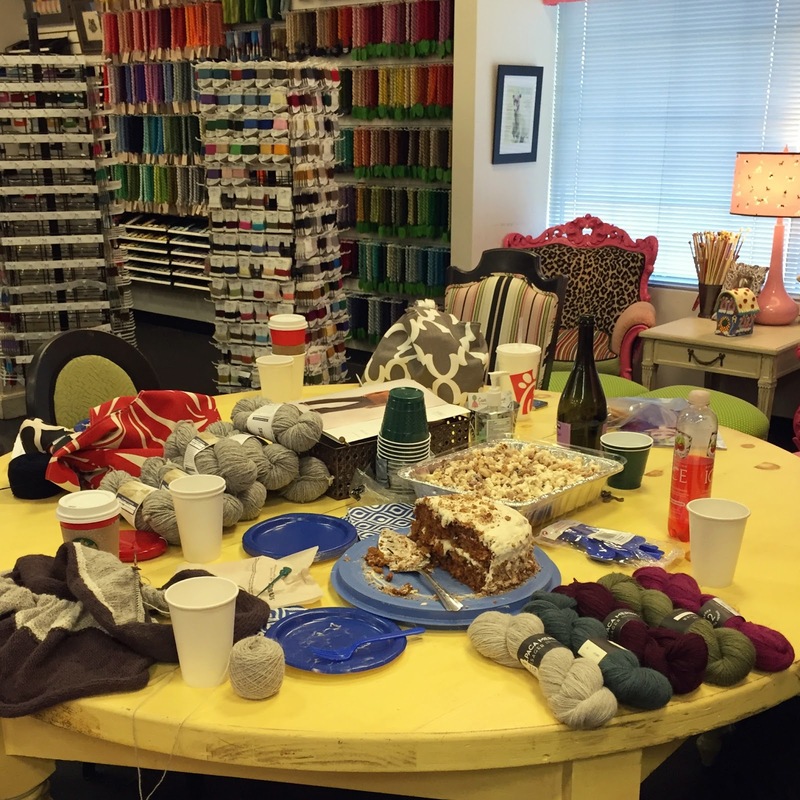 …and that pile of gray yarn, mid-table? happy birthday to me (again!) … and a tale for another day! One Word Wednesday | Progress. Woo Hoo! You've got the right kind of friends! Congrats on the yarn purchase (never a bad day there!) can't wait to see what you do. And Happy Birthday Week! That picture has all the ingredients for a really wonderful celebration! Yarn, cake, popcorn, wine, and friends presumably just outside the photo make for a great afternoon. Wishing you a Happy, Happy Birthday Week! The only way to celebrate a birthday is for a full week (or month!)! I hope the rest of your birthday week is just as amazing! The popcorn recipe sounds delicious and all I need to do is sub gf pretzels! Happy Birthday week Mary! Looks like so much fun at that yellow table! I'm still celebrating my Oct 31 birthday, since a local yarn shop is closing (unfortunately, after 30 years!) Yesterday I did quite a bit of stash enhancing! Quite a bit of Shibui and Brooklyn Tweed, along with a smattering of some Rowan yarns. Can't wait to see what you knit with that gorgeous gray yarn!! That sounds like a fun way to begin your birthday celebration! Happy Birthday week! Just a week?! I would love to have a seat at the table – looks like great fun and yellow *is* my favorite color! Enjoy! Enjoy! I was wondering about that pile of grey yarn!